In this blog we will run down 4 tips to help your Facebook recruitment campaign be as successful as possible. I'm glad you asked. If you're just getting started in your social recruitment journey, well, you're a little bit late to the party. But, better late than never, as they say. Now that you are putting together a social recruitment strategy, Facebook will be one of the main platforms you will want to focus on. Why? Well, to put it simply, it's one of the largest talent pools among social media platforms. As of 2017, 67% of job candidates were using Facebook, both active and passive. That is A LOT of candidates. Can you afford to not be reaching them? Having narrow parameters around the characteristics of your ideal candidate will help you in two ways. One, it will attract the right candidate you need to fill your open position(s), leading to a better hire and better retention. Serving an ad that is relevant to your audience will result in better audience engagement. Obviously that is important. Two, it will help you more efficiently spend your social recruiting dollars. By having a smaller audience to reach, you will reduce the possibility of paying for ads being served to an audience they are not relevant to. You can specify your target audience by age, education level and location. It's even become a valuable tool for recruiting military veterans. When creating your Facebook recruitment ad there are a couple things to keep in mind. 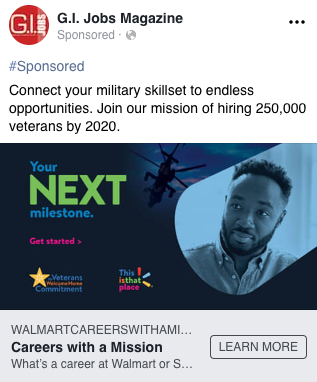 As you craft your Facebook recruitment ad message, keep in mind that this will be going to both active and passive job seekers. Be as specific as possible with your language and craft it as if you are having a conversation directly with your ideal candidate. This might include using industry jargon or language that only your ideal candidate may relate to. Be sure to highlight unique aspects and benefits of your company to compel passive candidates to learn more. Should you use a traditional image based ad, remember to keep the text within that ad to a minimum. Facebook places restrictions on how much text can be shown over your image, so you'll want to be as succinct as possible. Consider using the bulk of your text within the message that appears in the "status" of your post. Along with being a more compelling experience for your audience, video offers a more dynamic way to highlight your company's unique offer. Using video in recruitment allows you to humanize your company, bringing your candidates inside for a closer look at the culture, perks and day-to-day happenings they can expect. Here is a great example of an image based ad we ran for Walmart with our G.I. Jobs brand. Notice the minimal, succinct text over the image, and the direct message used in the post. This goes right along with the messaging and content within your ad, but it can't be stressed enough. Your employer brand is what makes your company unique. It's what your company does and how it is different from all of the other work environments out there. It's basically your sales pitch to prospective candidates. It's more important than ever to stand out from the pack. So when you're producing your Facebook ads, be sure to choose unique characteristics of your company like remote work opportunities, awesome benefits, company events, and employee success stories. This is where the use of video can be a real boon to your recruitment campaign. Using video allows you to showcase your employer brand in a more engaging way, not to mention that it allows you to hit on multiple aspects of your employer brand, as opposed to a still image, which may offer more difficulty in that regard. Here is a perfect example of promoting your employer brand in a recruitment ad. Spotify came up with flexible public holidays, a unique benefit they offer their employees. They use it to generate interest from potential candidates. This one seems like it would be pretty obvious, but I've seen far too many job ads that lead to a company's home page or "about us" page. If you are advertising jobs, it would seem to make a modicum of sense to link to your jobs page, right? More specifically, if you are advertising a single open position or multiple openings for the same type of position, for example a software developer, your ad should be linked directly to that job opening on your website. Keep the candidate experience in mind. You want to make it as easy as possible for that candidate to go from the awareness stage of their journey to the consideration stage of their journey.